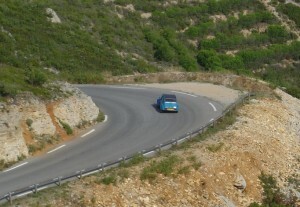 If you are visiting France this summer, you may well be driving to your holiday destination. You may have driven on the French roads numerous times in the past or this may be your first time. Whatever the case, read on for top tips for driving in France including staying safe, staying legal and saving money on your journey. Distances in France are deceptive. It is a big country so don’t underestimate the amount of time that it will take you to travel from A to B. Using a route planner will help you to accurately plan your journey and also to get an idea of the fuel and toll costs that you are likely to incur. There are numerous route planning websites on the internet, but I like to use Google Maps not only because it is easy to use but also because of the Streetview facility which is invaluable if you want to see exactly where you are going. Before you go, save a lot of time and frustration on the roads by checking whether there any roadworks or other traffic delays on your planned route. The Bison Futé website is invaluable for this as it provides not only real time traffic news for the autoroute network including alerts on road works, accidents and peak time traffic jams but also a very useful PDF page indicating which days are ‘peak’ days on the roads. If at all possible, avoid travelling on the black colour-coded days when the roads will be at their busiest. The AA website has a very useful page highlighting equipment that you need to have in the car when driving in France. You may have heard conflicting information about the need to carry alcohol breathalysers in the car when driving in France. The situation is that they are a mandatory item but there is no penalty if you don’t have them in the car – work that one out! In one word, don’t. The chances are, you won’t get away with it. Not only are there an increased number of unmarked police cars on the autoroutes but the number of speed cameras has increased enormously over recent months. Ah, but my GPS device will tell me where the speed cameras are, I hear you say. But beware! Since a law change in 2012, drivers are not allowed to have in the car a device which is capable of detecting speed cameras and includes devices able to warn or inform of the location of speed cameras e.g. satnav or gps systems capable of showing speed camera sites as PoI. Penalties can include fines of up to €1,500, confiscation of the device and even of the vehicle. You must either switch off camera alerts on your device or obtain a software update from the manufacturer before travelling. The AA website includes a very useful article on the subject. One of the classic speeding errors nowadays occurs when you are following the speed indicated by you GPS and you fail to slow down for temporary speed restrictions… watch out for this particularly on motorways in rainy weather or during roadworks. The French autoroutes are so much quieter than the UK motorways and generally a real pleasure to use. The service stations or ‘Aires’ range from lovely little pull-ins equipped with toilets and picnic tables away from the road (look out for the ‘Aire’ signs that include the picnic table symbol rather than the knife and fork restaurant one), to the fully equipped service stations with fuel, restaurant and toilet facilities. I find the French Autoroute website invaluable when planning a journey through France as it gives you detailed information on the facilities that are available at each ‘Aire’. If you are driving on the toll roads for the first time it really does help to know in advance how the system works. 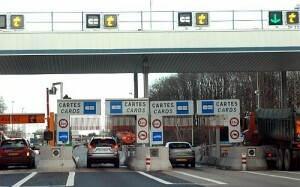 As you enter a tolled section of autoroute, you will need to take a ticket from the machine. Simple. Just don’t lose the ticket! Keep it somewhere accessible along with your credit card (Visa and Mastercard are accepted on the network). As you are leaving a tolled section of the autoroute, you will approach a ‘Gare de Péage’. 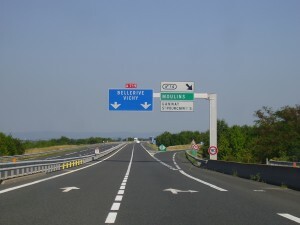 The only thing you need to remember is NOT to head for a lane with a bright Orange banner and ‘T’ sign indicating Télépéage (like the one on the left of the picture above) unless you have purchased a Liber-t transponder in advance. This is not worth doing unless you are a frequent user of the French autoroutes. The terminals in the lanes with green arrows accept all payment methods (cards as well as cash) and the ones marked ‘cartes’ only accept cards. Just pop your ticket into the first slot and then your card into the second and then press the button for a receipt if you need one. The barrier will open and off you go. Easy. 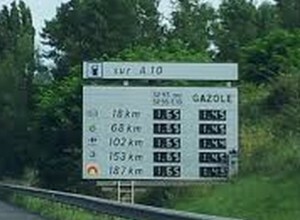 Fuel at the motorway service stations can be at least €0,15/ltr more than you will pay off the network. It’s a long drive down to the South of France from the Northern ferry ports (10 hours from Calais down to Avignon, for example) so make your trip down part of the holiday. Break up your journey by planning an overnight stop (or why not longer if you have the time) somewhere pretty and welcoming from where you can continue your onward journey relaxed and refreshed. 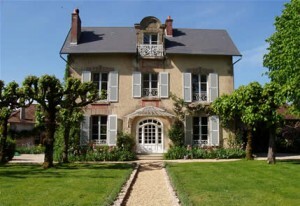 Plan your stopover using our map of B&Bs in France. Obviously this article is not exhaustive as you could fill a book with advice and information on driving in France. But I hope you find it useful all the same.